The syntheses of two new indenyl-based cobalt(I) complexes were reported and their properties as catalysts in asymmetric cyclotrimerizations evaluated. 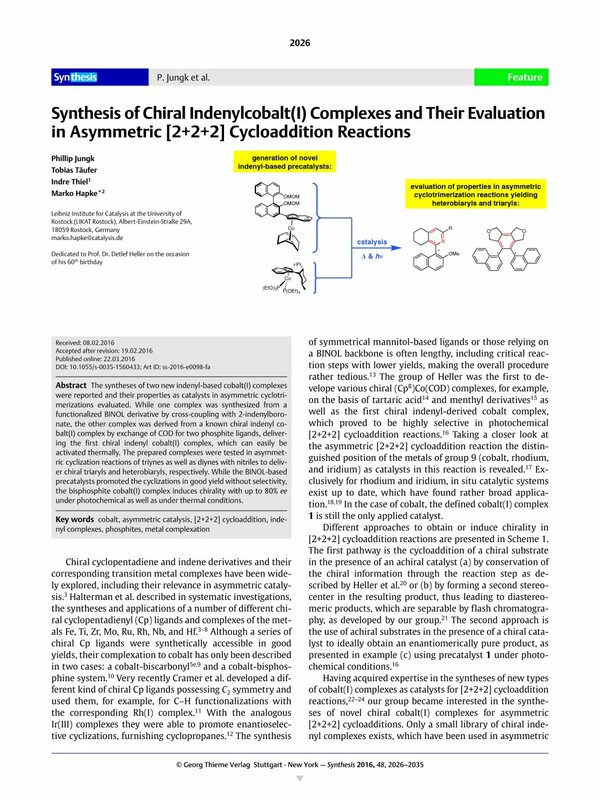 While one complex was synthesized from a functionalized BINOL derivative by cross-coupling with 2-indenylboronate, the other complex was derived from a known chiral indenyl cobalt(I) complex by exchange of COD for two phosphite ligands, delivering the first chiral indenyl cobalt(I) complex, which can easily be activated thermally. The prepared complexes were tested in asymmetric cyclization reactions of triynes as well as diynes with nitriles to deliver chiral triaryls and heterobiaryls, respectively. While the BINOL-based precatalysts promoted the cyclizations in good yield without selectivity, the bisphosphite cobalt(I) complex induces chirality with up to 80% ee under photochemical as well as under thermal conditions. Supporting information for this article is available online at http://dx.doi.org/10.1055/s-0035-1560433. 1 Current address: Laboratory of Inorganic Chemistry, ETH Zürich, Vladimir-Prelog-Weg 3, 8093 Zurich, Switzerland. 2 Additional address since November 1, 2015: Johannes Kepler University Linz, Institute for Catalysis, Altenberger Str. 69, 4040 Linz, Austria.